Your normal mopping just doesn’t seem to be cutting it anymore. The grout’s looking a bit tired, so you get down on your hands and knees, with a scrubbing brush, a bucket of floor cleaner or better yet, bleach and proceed to spend the next few hours trying to make it look better with mixed results… does that sound familiar? Or you can call the professionals to come in with our specialised cleaning agents and high-performance cleaning systems that will leave delighted with the results and at a price that won’t break the bank OR your back and knees! Our cleaning system will remove those deeply embedded soils that you simply cannot reach, leaving your floors nearly dry and healthily cleaned with most contaminants removed. 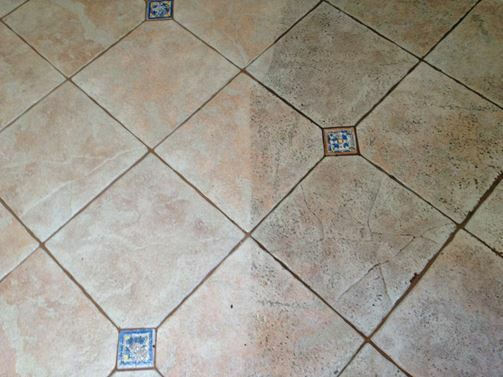 We guarantee to restore the shine with our professional solutions for tile and grout cleaning in Perth, WA. Once you have cleaned your tile and grout, you may also want to consider sealing them, to help you maintain them more easily. Sealing the grout and some porous tiles creates an invisible shield which helps to prevent dirt, dust, and liquids from lodging on the surface, giving you more time to clean up and remove spills before they are absorbed into the porous surface of your tiles and grout. Your tiles and grout will stay cleaner, brighter and fresher longer. Did you know that most grout is not sealed during installation? This is why grout absorbs all types of soil and rapidly discolours. Grout is very porous; mopping floors only removes a portion of soil. To compound the situation most of the detergents used to mop floors generally leave a tacky residue, this attracts the dirt and grime causing your tiles and grout to re-soil prematurely. To find out what we can do to make your life easier, contact our tile and grout cleaners on 0418 914 097 or via our contact form to discuss your particular needs.